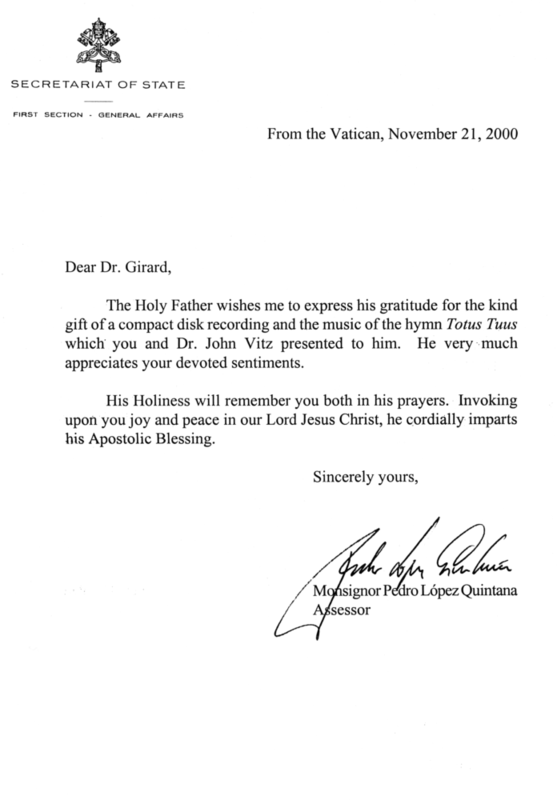 In November, 2000, my mentor, Sharon E. Girard, PhD, was in Rome where she graciously presented one of my works to Pope John Paul II on my behalf. Totus Tuus is a meditative hymn based on the original 15 Mysteries of the Rosary. Sharon and I were both pleasantly surprised when we received this token of appreciation from The Vatican! Click the image to see the full letter. Thank you for sharing with me, the script and CD of the Curé of Ars Musical. I appreciate the devoted sentiments which prompted you to share such a wonderful piece. It brings me great joy to witness individuals as yourself in our diocese, using your talents to build up the Kingdom of God. This is very encouraging to my ministry. “The music is still resounding in my head….I just had to tell you what a magnificent, enthralling, inspiring and intense experience Sunday’s concert was for me. I have never participated in a musical presentation like it….ever! I will never forget the last note tapering off into the dome and seeing the entire audience rise in huge applause and celebration!! What a wonderful achievement” Judy D.
“That was awesome!! Thank you for sharing your God-given gift with us. I kept on feeling that I had experienced this before – recently. And, then it came to me…I had….Mel Gibson’s “Passion of the Christ”. Your Mass was/is in that league. I hope this will give you some idea of how moved I was. Thank you” Paul S.
“Congratulations! A Mass for Peace in the Third Millennium is inspiring, beautifully sensitive, and peaceful to hear. Your talents bring happiness to one’s heart and soul” Sharon D.
“Music has always been an important part of my life. My father loved opera, so I was introduced at an early age to all the great artists of his day. My husband spent much of his leisure listening to symphonies and opera arias. I’m mentioning this so you’ll know I’ve always been exposed to classical music. Your music celebrating ‘Peace in the Third Millennium’ was joyous and glorious, and I felt so fortunate I chose to go to your concert. Your music deserves to be heard by the multitude. It is difficult for me to express how remarkable and beautiful I found your composition. You have been blessed with a marvelous talent. I feel privileged to have attended your musical” Elaine B. “We cannot say when we have been more uplifted, encouraged, and inspired than we were yesterday afternoon in Berkeley through hearing that wonderful premiere presentation of you’re a Mass for Peace in the Third Millennium. It is truly a magnificent and, without doubt, a Spirit-inspired work that elevates our Lord and honors Him throughout. Such a work, in our opinion, can be accomplished only through the mind and heart of a genius or through God’s Spirit, and we feel that both must have played a key role in what we heard yesterday. We had never expected to have such a musically-celestial, soul-stirring experience this side of God’s heaven! It is our hope that, somehow, the Mass can be made available to the world. It was a distinct privilege to be present yesterday and we feel we are better people for being there. We shall not soon forget this experience. We thank God for you and your fantastic gift of music composition; and we thank you so much for making this experience possible” Charles W.
“Thank you for the magnificent opportunity to share the awe and grandiosity of the Eucharist. Your gift is meant to last for centuries to come. I feel humbled to have been a witness of the premiere” Marcia C.
“An extraordinary, heart-filled music event took place on Sept. 12 at St. Joseph the Worker Church in Berkeley. Six hundred people attended a Concert for Peace that celebrated the parish’s 125th anniversary and also served to honor the late Father Bill O’Donnell, peace and justice advocate. The Mass is a compilation of many Latin texts of the Ordinary of the Mass, including the opening greeting “Pax Vobiscum,” the “Orate, Fratres” and the most solemn and triumphant harmonies set to the actual words of consecration. From the very first moment the haunting melodies, interweaving chords and unique dissonance called the audience into rapt attention. There was an awesome spiritual presence in the church as the listeners were stunned by the sounds of grand chorus and orchestra, side by side with musical surprises such as the addition of bells, guitar and synthesizer. In this beautiful work, composer John W. Vitz shared his deep spirituality and his mission to share the solemnity of the sacred music within the realm of both traditional harmony and contemporary musical style. Audience attendees were immediately on their feet with an ovation that reflected a sense of awe and privilege, experiencing sacred music that, in the words of many present, touched their hearts with renewed spiritual meaning.